DAYTONA BEACH, Fla. — The NASCAR K&N Pro Series West season will continue Saturday with the Toyota/NAPA Auto Parts 150 at Spokane County Raceway in Washington. Below is a look at the Toyota/NAPA Auto Parts 150 and some of the selected participants. • Reigning K&N Pro Series West champion Todd Gilliland of Sherrills Ford, North Carolina, has won three consecutive races headed into the weekend, including a sweep of the twin 100s at California’s Irwindale Event Center. • The NASCAR Next driver has a 13-point lead atop the standings over Bill McAnally Racing teammate Chris Eggleston, who won the season opener at Arizona's Tucson Speedway. • Spokane County Raceway is a multi-purpose motorsports facility which includes a quarter-mile drag strip, a 2.3-mile road course and half-mile asphalt oval. • The half-mile “Super Oval” hosts regional Super Late Model and Late Model events throughout the season. • This is the series’ third event at Spokane and the first since 2013. 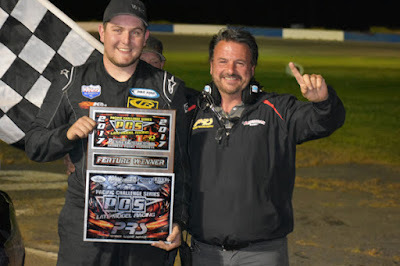 • Two different drivers have won previously at Spokane with Eric Holmes winning the inaugural event in 2011 and Greg Pursley winning the most recent event in 2013. • Two different drivers have earned poles at Spokane — Dylan Kwasniewski (2011) and Cameron Hayley (2013). • The record for most cautions in an event at Spokane is 11, set in 2011, when 47 laps were run under the yellow flag. • The record for fewest cautions at Spokane was set in 2013 with four. • There has been an average of 3.5 lead changes in K&N Pro Series West races at the track. 1-lap Qualifying Record: Cameron Hayley, Toyota, 97.720 mph, August 2013. 150-lap Race Record: Greg Pursley, Ford, 1 hour, 2 minutes, 11 seconds, (72.367 mph), August 2013. • Currently sits sixth in the NASCAR K&N Pro Series West standings with two top fives and three top 10s in four starts this season. • Scored career-best finishes of third at both California’s Kern County Raceway Park and Irwindale Event Center this season. • Currently sits fourth in the K&N Pro Series West standings with one top five and four top 10s in four starts this season. • Finished 10th in the final series standings in 2015, her only full season with the series. • Is from Otis Orchards, Washington. • Has six career K&N Pro Series West wins with 23 top fives and 26 top 10s in 35 career starts. • Was the 2015 series champion for Bill McAnally Racing. • Won the season opener at Arizona’s Tucson Speedway in March. • Has an average starting position of 2.0 and average finishing position of 2.2 in four races this season. • Won six of 14 races last season with 11 top fives and 13 top 10s en route to the K&N Pro Series West championship, to become the youngest champion in NASCAR history at 16 years, five months, and joining his grandfather, Butch Gilliland, as a K&N Pro Series West champion (1997). • Enters the weekend on the strength of a three-race winning streak, the second of his career, with three wins, four top fives and four top 10s in four races this season. • Has yet to finish worse than second in any series event to date. • Made his K&N Pro Series debut in the East opener at Florida’s New Smyrna Speedway and finished third. • Sits fifth in the current standings with two top fives and three top 10s through four races. • Finished fourth in the final standings last season to become the highest finishing female driver in K&N Pro Series West history. • Posted seven top fives and 13 top 10s in 14 races last season as a rookie. • Enters weekend off back-to-back top 10 finishes in the NAPA Auto Parts Twin 100s at Irwindale in March. • Despite missing the season opener, he ranks 13th in the current standings with one top five and three top 10s in three starts. • Is the only driver entered this weekend to have competed previously at Spokane with the series, where he’s finished sixth twice and led 78 laps in August of 2013. • Has six career K&N Pro Series West wins, including two at both Brainerd (Minn.) International Raceway and Iowa Speedway. • Competed in six races last season and is running for the Sunoco Rookie of the Year title this year. • Is one of only three drivers to finish in the top five in all four races thus far, ranking third in the overall standings. • Posted a career best finish of third at Kern County in March. • The 2017 season is the 64th for the NASCAR K&N Pro Series West. • The 2017 schedule features 14 races at 12 different tracks across the United States. • Third-generation driver Todd Gilliland won the season opener last year at Irwindale Speedway, the first of two straight wins to open the year. • Todd Gilliland swept the NAPA Auto Parts Twin 100s at Irwindale in March and has won three straight races to date. 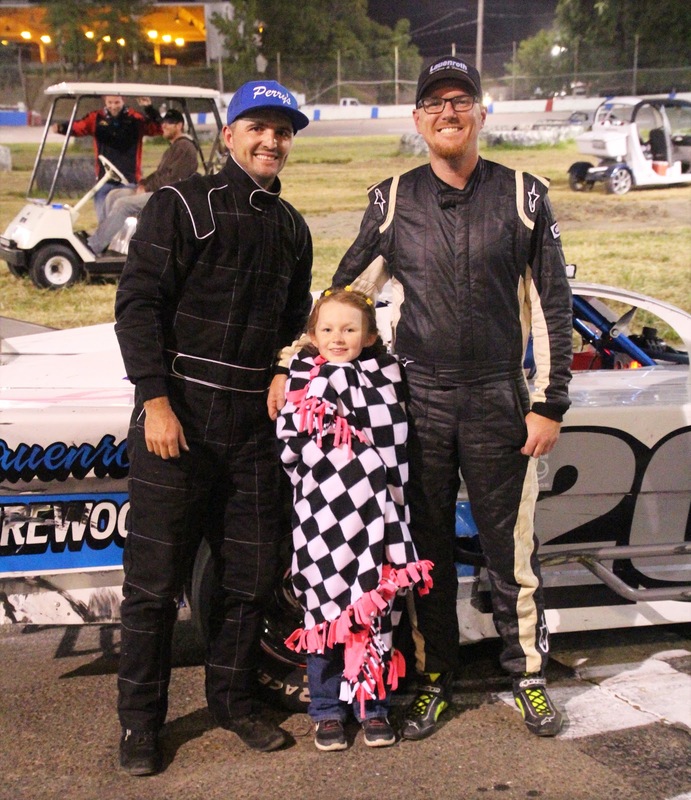 • Chris Eggleston won the season opener at Arizona's Tucson Speedway. DAYTONA BEACH, Fla. — Every driver in every car not lettered with the No. 16 on the side will be out to stop the momentum of reigning series champion Todd Gilliland when the NASCAR K&N Pro Series West returns to action in the Toyota/NAPA Auto Parts 150 at Spokane County Raceway in Washington on Saturday, May 13. The race marks the series’ first visit to Spokane since 2013. A member of the 2016-2017 NASCAR NEXT class, Gilliland has won three of the first four races of the season, giving him nine wins over the last 15 months, and his sweep of the NAPA Auto Parts Twin 100s at California’s Irwindale Event Center in late March built him a 13-point cushion over teammate Chris Eggleston atop the standings a quarter of the way through the schedule. Eggleston, who won the season opener at Arizona's Tucson Speedway, has been the only driver to slow the 16-year-old Sherrills Ford, North Carolina, teen’s march toward a second consecutive championship. Gilliland became the youngest NASCAR champion, national or touring, in history by winning the 2016 NASCAR K&N Pro Series West title. While the two Bill McAnally Racing drivers have combined to win the first four races of the 2017 season and sits one-two atop the standings, they aren’t the only drivers off to a hot start. Rookie Will Rodgers is the only other driver to finish in the top five in every single race to date. Rodgers, 22, finished a career-best third at California’s Kern County Raceway Park before posting back-to-back fifth-place finishes in the twin features at Irwindale. Part of Gilliland’s success this season, without question, has been his ability to start up front. He’s won all four pole positions this season and hasn’t finished worse than second. In his young K&N Pro Series West career, Gilliland has 10 wins, 10 poles, 16 top fives and 18 top 10s in just 19 starts. He’s only finished outside the top 10 once — at California’s Sonoma Raceway last June, a 24th-place finish that he followed by winning the next three consecutive races. That streak matches his current career-best three-race winning streak. EVENT SCHEDULE: Saturday, May 13 – Garage opens: 11 a.m.; Practice: 3-3:45 p.m., 4-4:45 p.m.; Group qualifying: 5:15 p.m.; Driver autograph session: 6:25 p.m.; NAPA 150: 8:15 p.m. The Race: Toyota/NAPA Auto Parts 150 will be the fifth of 14 races on the 2017 NASCAR K&N Pro Series West schedule. The Procedure: The maximum starting field is 24 cars, including provisionals. The first 20 cars will secure starting positions based on the group qualifying process. The remaining four spots will be awarded through the provisional process. The race will be 150 laps (75 miles) with a five-minute break occurring at or near the conclusion of lap 75. The Track: A .500-mile asphalt oval, Spokane County Raceway is a multi-use venue that includes a paved oval for stock car racing, a 2.3-mile road course and a full quarter-mile drag strip. Race Winners: There have been two different winners in the two previous K&N Pro Series West races held at Spokane. Eric Holmes won the inaugural series race at the track in 2011, while Greg Pursley won the most recent event held there in 2013. Pole Winners: In the two previous events at Spokane, there have also been two different pole winners. Dylan Kwasniewski won the pole in 2011, while Cameron Hayley was the pole winner for the 2013 event. Home Track Advantage: When Spokane’s Nicole Behar finished second at California’s Irwindale Event Center in 2015, she posted the highest race finish in series history by a woman. Behar, returning to full-time K&N Pro Series West competition this season, is hoping that her first series visit to her home track will provide her first career win. Behar sits fourth in the current standings with four straight top-10 finishes to begin the season, equaling a career-best stretch she first accomplished from July to August in 2015. The 19-year old driver has proven an ability to drive through the field — improving better than 10 spots each race from her average starting position of 17.2. Return Engagement: Park City, Utah, driver Michael Self has made an impressive return to the NASCAR K&N Pro Series West this season. After missing the season opener, Self has aligned with longtime series owner Bob Bruncati to drive the No. 9 Sunrise Ford/Eibach Springs/Lucas Oil Ford, and he’s been off to a strong start with his new ride. In his first start in the series since the 2013 season finale, Self finished sixth at California’s Kern County Raceway Park and then went on to post finishes of sixth and third, respectively, in the NAPA Auto Parts Twin 100s at Irwindale two days later. Self won six races from 2012-2013 in the series and finished a career-high of fourth in the final standings in 2013. He never finished outside the top 10 in the standings in any of the four full seasons he competed in from 2010-2013. Rookie Crop: A total of four rookies sit in the top nine positions in the K&N Pro Series West standings heading into Spokane. Will Rodgers ranks third overall with top-five finishes in all four races to start the season, while Derek Kraus and Garrett Archer are fifth and sixth, respectively. Both Kraus and Archer have three top 10s already this season. Kody Vanderwal is ninth in the standings with a pair of top-10 finishes. Championship Pedigree: While no champion’s title run contained a win at Spokane during the 2011 and 2013 campaigns, two of the most accomplished drivers in K&N Pro Series West history earned wins in the only two races held at the half-mile track. Three-time series champion Eric Holmes won the inaugural K&N West race at Spokane in 2011, leading 95 of the 200 laps, while two-time champion Greg Pursley won the most recent event at the track in 2013. Qualifying also provided a glimpse into the NASCAR future, with Dylan Kwasniewski — a future series champion and NASCAR XFINITY Series driver — won the pole for in 2011 and Cameron Hayley sitting on in 2013. Hayley spent three seasons in the NASCAR Camping World Truck Series and finished a career best of sixth in the final 2015 standings. May 6, 2017 ....Lakeport , CA...... When unfortunate mechanical failures saw both leader Kyle Tellstrom of Ukiah and second place runner Charlie Collins of Upper Lake forced to take their modifieds to the pits, defending champion Darrin Knight of Kelseyville found himself in the lead with only 21 laps to go, and drove the remaining laps flawlessly to capture race #2 of the North State Modified Series, presented by Protect the Harvest, at Lakeport Speedway Saturday night. This was 2 consecutive NSMS wins for Knight. Earlier Tellstrom blistered Tripp Gaylord's track record of 12.287 with a 12.150 second lap earning the $100 Sunoco/Penney Racing Supply fast time award. He went on to draw the “Lucky #4” chip for the inversion. This put Darin Snider on the pole for the 60 lap feature with Collins on the outside front row. Knight and Tellstrom started third and fourth on the grid, with Eric Johnson and Darrin Sullivan sharing the third row. When the green flag flew Collins charged to the front with Tellstrom following his line. Knight drove under Snider for third on lap six. A 4-lap side-by-side battle for third ended on lap 13 when Johnson cleared Snider and settled into fourth place. Collins drove high on 14, and it was all Tellstrom needed to fill the gap and power into the lead. Tellstrom's car was on a rail, lapping as many as three cars in a single round. The only yellow flag of the event happened on lap 39 when Oregon driver Rich Cobb spun on the front stretch. While the cars were slowed, track official discovered that fluid was being dropped all the way around the track. The problem was coming from Tellstrom's rear end, and he had to end his impressive run and drive to the pits. Three lapped cars driven by Cameron Austin, Darrin Sullivan and Ian Elliott, were running between Tellstrom and Collins, and those cars moved to the rear and picked up their laps. Collins became the new leader, but before action could resume, Collins had a tire go flat and also had to pit for a change. Four more lapped cars running between Collins and Knight moved to the back to gain back a lap. These four were Sierra Furia, Dustin DeRosier, Adrianna Strugnell and Simi Tour. With both Tellstrom and Collins in the pits Knight inherited the lead. Eric Johnson moved into second with Snider third, Bryan Denton fourth and Codi Barba fifth. Knight pulled away on the restart, but Johnson closed in when the leaders caught slower traffic. In the closing laps Collins worked his way back to rejoin the front runners, and at the checked flag it was Knight, Johnson, Snider, Denton, Collins, Austin, Sullivan, DeRosier and Sierra Furia. Rounding out the top 20 were Strugnell, Richie Potts, Jason Philpot, Wade Coleman, Ian Elliott, Simi Tour, Rich Cobb, Sal Lopez, Tellstrom, and Cody Braund. In the Lucas Oil Dash for Cash Codi Barba collected $100 for the win, with Cameron Austin earning $50 for second. The series moves North to Redwood Acres Raceway in Eureka for Race #3. This event will be a Sunday evening show on May 28 of Memorial Day weekend. The North State Modified Series is presented by: Protect the Harvest, Lucas Oil, Sinister Diesel, Penney Racing Supply, American Racer Tires, Naake Suspension, Sunoco Race Fuels, Five Star Bodies, Racer Bling, Keyser Racing Products, Scribner Plastics, DJ Safety, and the Buckhorn Bar & Grill. ANDERSON, CALIFORNIA (May 6, 2017) - Anderson's Derek Copeland led a strong contingent of local drivers taking on the Pacific Challenge Series regulars on Saturday night at Shasta Speedway, grabbing the Spring Shootout 100 presented by PenneyLawyers.com. Copeland's victory makes him the second first-time PCS winner in 2017 in as many races, joining Madera winner Carlos Vieira in that club. The victory came in a hard earned 14 lap shootout against a 19 car turnout at the 3/8ths mile speedway. Jason Romero again flexed his qualifying muscle scoring quick-time with a new track record at 15.406 in his first Shasta PCS start. The series held a pair of dashes with the B Dash for the lower qualified cars won by local Trevor Harrison for $200. Redding's Eric Gannon drew the pole for the A Dash but Romero swept past him on the outside line to take the $500 victory worth the pole for the 100 lap feature. Romero led the field to the green flag and charged away with fourth starting Copeland rolling the outside to quickly assume second place. 2006 Westcar Series Shasta winner Shannon Mansch pounced on Gannon for third by lap eight and eventually a five car line fought for the position. Cole Moore ran side-by-side with father John Moore for the fourth spot several times as well early in the race. Romero surrendered the lead with a flat right rear tire on lap 18, allowing Copeland to take control of the race. The first caution did not come out until lap 23 when 2016 Shasta winner Tracy Bolin had contact with Matt Wendt. Bolin's race was over when he retired to the pits with front end damage. Romero re-emerged from the pits with a new right rear tire although he was four laps behind. A thrilling battle unfolded for the second position with Mansch trying to hold off John Moore, Cole Moore, and Travis Milburn. The battle intensified on lap 47 with Mansch and John Moore sliding off of turn four but the race stayed under green. Mike Beeler and Eric Gannon raced nose-to-tail for the sixth position until Gannon slowed on lap 55 with an issue and a lap later Cole Moore stopped in turn three with a distributor issue. Both Gannon and Cole Moore failed to return to the race. Copeland motored away on the restart while Milburn took several looks inside John Moore for third. The jockeying continued nose-to-tail until lap 81 when Milburn turned up the wick on Moore and took over third. He worked past Mansch one lap later to run second. A caution for a slowing Ryan Peeples of Anderson on lap 86 set up a 14 lap shootout to the finish. Robert Vining had a wheel come off under caution as well. Copeland picked the inside line for the critical restart alongside Milburn. The restart went well for Copeland and he drove away from Milburn, who found himself freighttrained by Moore as well. Milburn slid into third with Beeler overhauling Mansch for fourth in the closing stages of the race. Copeland claimed the 1.3 second victory ahead of John Moore, Milburn, Beeler, and Mansch. 2016 Rookie of the Year Matt Wendt ran sixth with Chris Scribner seventh. Jason Romero recovered to finish ninth. Trevor Harrison advanced from 15th to finish eighth to win the Penney Racing Supply Hard Charger. John Moore will lead Mike Beeler by six points in the championship standings heading into Stockton 99 Speedway, when the series competes in round #1 of the Tri-Holiday Series on May 20th.